Field Recording Workshop: Movement of Acoustic Images :: Speakers: Alessandro Massobrio, Fabio Orsi, Natasha Barrett :: Curated by Matteo Milani, Federico Placidi (U.S.O. 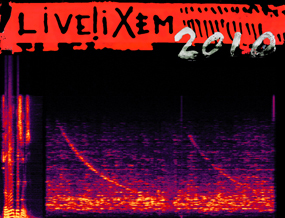 Project) and Domenico Sciajno :: @ Live!iXem 2010 – Edition VII — International festival of music, mixed media and experimental electronic art :: September 17, 2010. The workshop’s aim is to provide an introduction to theory and practice of the main mobile sound recording techniques and the use of sound sources in different fields, from sound design to cinema, from digital editing to the use of digital sources in instrumental composition, electronic music and live electronics. Music compositions and musical excerpts from field recordings will also be introduced, listened and discussed. All members are invited to participate in the soundwalk along the neighborhood “Isola” in Milan and thus contribute during the workshop to the creation of a small sound map of the place. The pieces obtained at the end of the workshop will be diffused through a multi-channel audio speakers setup and then available to the public in the form of soundscape composition. Discuss some aspects of the use of specific material in electronic and instrumental composition. Localization of sound in the environment focuses on the theme “sound mapping” as a social and cultural identity and, at the same time, an expression of conscience and personal feelings, whereas its use in music opens important interdisciplinary horizons. Guitarist and composer, he is interested in working in collaboration with other art forms and works with experimental cinema and audiovisual art. He composes instrumental music as well as electronic pieces. His personal research focuses on illusion, relationship between sound and geometry, animal sound communication, emotions and thoughts. His music is related to the control of the physical gesture, timbre, decay and concrete material in order to create electronic-like structures and effect. As a performer he plays e.guitar and electronics in the audiovisual project Flushing Device. Fabio Orsi is an electronic musician specializing in atmospheric drone. Fabio Orsi has consolidated his reputation as a key figure of the international nu-folk electronica underground with a bewildering yet fascinating series of solo works and collaborations dominated by psychedelically flavoured soundscapes. Orsi creates atmospheric audio postcards with a tangible sense of time and place, utilizing layers of guitars, old keyboards and found sounds, having a keen attention to details, loops develop so naturally that it’s almost impossible to notice when certain sounds are brought in and out. Natasha Barrett works foremostly with composition and creative uses of sound. Her output spans concert composition through to sound-art, sound-architecture, installations, interactive works. Whether writing for instrumental performers or electronic media her compositional aesthetics are derived from acousmatic issues focusing on the aural perception of detail, structure and potential meaning, and an interest in techniques that reveal detail the ear will normally miss. The composition and manipulation of space is a central element in much of this work. As a performer she works with electronics, improvisation and the interpretation of acousmatic works.